Most American Jews born after World War II honor and respect Holocaust survivors including former concentration camp inmates with numbers tattooed on their forearms, but that was not always the case. When such survivors started arriving as immigrants to the United States in the late 1940s and early 1950s the reception they received was often cautious and chilly. We now know that surviving the hellish conditions of the Nazi camps was a matter of random chance, but in the decade following the liberation of those camps many American Jews assumed that those who survived did so at the expense of fellow inmates who perished, whether by stealing another inmate’s food or clothing or by in some way collaborating with the enemy guards. But even without that background knowledge—which novelist Jay Greenfield does not explicitly mention in his debut page-turner Max’s Diamonds—readers will understand 14-year-old only child Paul Hartman’s wariness at the novel’s beginning in 1947 when his widowed mother asks him to switch bedrooms with her so that he can share the larger bedroom with their middle-aged cousin Max. Max arrives bearing expensive gifts and a number tattooed on his forearm. Paul views the origin of Max’s wealth with suspicion. Paul’s conflict is that he doesn’t want to be tainted by Max’s largess but is reluctant to forfeit the educational opportunities it affords him. The Hartmans immigrate to the United States when Paul is an infant in 1933 from Teplice in the then-majority German Sudetenland region of Czechoslovakia and settle in the Arverne neighborhood of Rockaway, Queens, NY, where they own a small grocery store. Paul’s father has a coronary condition and dies of a heart attack while giving 10-year-old Paul a swimming lesson. For years afterward Paul feels guilty for not following his mother’s precise instructions: instead of leaving his dad on the beach and running to the nearest pay phone to call an ambulance Paul helped his dad walk to the boardwalk where he asked passersby to place the call while he tried to retrieve his dad’s nitrogen capsules, which were administered too late to save him. Paul plays clarinet in his high-school orchestra, and Max’s initial gift to Paul is a concert level clarinet. Max is disappointed that the concert program Paul’s orchestra will perform includes a piece by 19th century German composer and anti-Semite Richard Wagner, but tells Paul to play the piece though he, Max, will not attend. The issue of whether or not Jewish musicians should play Wagner recurs much later in the novel. When Max commits suicide by drowning himself in the ocean, he leaves Paul a note and a key in his clarinet case, which Paul angrily takes to the end of a jetty and tosses into the ocean. Max leaves a fortune in diamonds in several bank vaults in multiple cities and countries. Even without the note Paul rips up and the key he throws away enough diamonds are retrieved to pay for Paul’s college and law school tuition at Ivy League universities. By his senior year of high school Paul is dating Sybil, a flautist whose affluent parents are assimilating Jewish-American social climbers who spend summers in Rockaway but live in suburban Long Island. By contrast Paul’s family belongs to an Orthodox synagogue, and his parents and relatives of their generation have switched from their native German to Yiddish when speaking among themselves so as not to speak the language of the Nazis. Paul and Sybil’s relationship continues during college with Paul at Columbia and Sybil at Juilliard. The theme of wives being unable to fulfill their potential so that their husbands can do so plays out in the 1950s when Paul is accepted at Harvard Law School and Sybil declines a job as a flautist in a prestigious ensemble in England, instead earning a degree in music education in the Boston area. It never occurs to Paul to apply to law school in England so that Sybil can pursue her ambition. After graduation Paul becomes a law clerk to a U.S. appellate court judge in Foley Square, and the couple move to Brooklyn Heights. The marriage is further strained as Paul, fascinated by his work, spends his nights in a law library and neglects Sybil. This is territory that has been explored by numerous authors, but unlike, say, John Updike’s or Philip Roth’s adulterous protagonists, Paul is more the clueless cuckold. 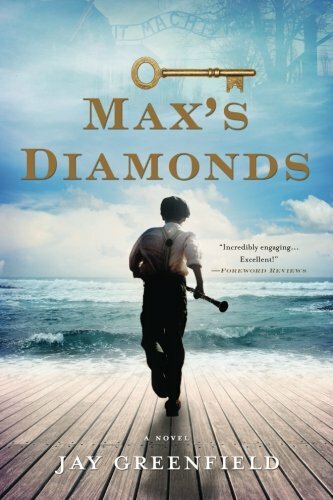 Nonetheless, with Max's Diamonds readers are rewarded with a fun and absorbing read whose fortuitous May publication date makes it a felicitous beach or airplane book.